We moved the Lectionary Readings up a week. Normally Advent 3 is John the Baptist 2, but our kid’s program is Advent 4, and skipping Mary for JB the sequel isn’t right. This sermon starts out with the observation on the recent year of Bible movies and how they really just miss the boat. When you cast Batman and Maximus the Gladiator you are after action and conflict. Not that Bible stories are absent that, but for the faithful what appears like a leading man or woman is anything but. They are held in the divine passive. By faith God acts through them. This is tied to the beatitude blessed are the meek for they shall inherit the earth. That is the beatitude that is probably the most despised by the world. The only thing the meek get is abuse. Yet the bible puts forward Moses as the meekest man on the face of the earth (not a role for Christian Bale) and then you get Mary – most highly favored lady, in the words of the hymn The Angel Gabriel from Heaven Came. It is meekness that makes way for God to act. 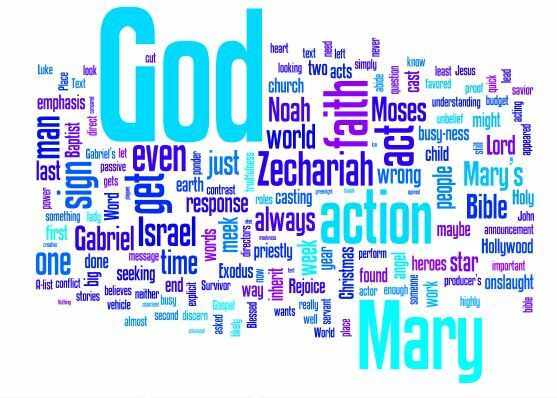 And God acted in a might way through Mary bringing about the salvation of the world through the incarnation. The application I tie this to is our general busy-ness, especially at Christmas. We are constantly casting ourselves as the action hero, not a meek role, and that casting leads to conflict. Mary response is not to jump into action but to ponder or to discern the greeting. And this greeting is not a dead letter, but echoes to another highly favored lady, the church. You have found grace. The Lord is with you. Rejoice, o daughter of Zion. Glory, Holiness, Duty and Other Archaic Concepts? Yesterday was Veteran’s Day or Armistice Day for those who like history. In prepping for Thursday’s bible class I has read this article. The author’s source – the Homeric Epics – is remote from most people. My attempt at a translation didn’t hit the mark yesterday, but I’ll use it here. If you have seen the young Brad Pitt in Legends of the Fall, think about the attitudes put forward by the youngest brother who enlists for WW1. The young Princeton lad is full of duty and glory and enlists, surely in part to live up to his Civil War vet father – a man who had no use for ‘Civilization’s wars’ and was living in Montana as far away as he could get. In that War the West burned out its concepts of glory. Tom Howard in that article was asking just that: where today do you find glory and its companion holiness? His is a familiar lament from a certain section of the church yearning for a more stately form. And that yearning in some should not be denied. There is holiness and majesty in God. But that feeling I think is foreign to most we are called to reach today. It took 2000 years, but I’m pretty sure that those wars of the 20th century burned out a bad idea. The bible’s picture of the glory of God might often be expressed in grand language (the Hebrew’s thought of glory in images of weight while the Greeks thought in images of light), but that seems to be a nod to God using our language. The “Ur” story in in Exodus 33:22-23. Moses wants to see God’s glory. He is shown God’s backside (in a euphemism). Hannah’s Prayer (1 Sam 2:8) and Mary’s song (Luke 1:46-55) both equate God’s glory to the radical reversal, to the lifting up of the lowly. The Psalms (Psalm 24:7, 85:9, 96:3, 102:15) always equate God’s glory with his work of salvation. God’s glory is not an attribute but an action. By Zechariah 2:5 the glory dwells within (foreshadowing the indwelling of the spirit?). That picture of God’s glory continues in the New Testament. We’ve seen Mary laud the glory of the great reversal. John (John 1:14) equates the glory of God with Jesus who is the fulfillment of grace and truth. The biblical picture of God’s glory is His work of salvation. God’s glory is seen best in what this world sees as abasement. Think of the progression of the Apostles Creed: only son of God to human infant to suffering to crucifixion to death to burial to hell. It is only when the Son has become the lowest that God raises Him up, places Him at the right hand and gives Him the authority as judge. What we think of as glory comes after what the Father thinks of as glory. God’s glory is seen in that work of service. In this world, we see the glory in the backside. In the next, we see face to face. So where do we find glory? In Christ on the cross. In everyone who portrays Christ amongst us. Not in pomp and ceremony but it service. And what about glory’s mate holiness? 2 Pet 1:3 – “His divine power has given us everything we need for life and godliness through our knowledge of him who called us by his own glory and goodness.” Because of Christ’s glory which has grabbed us, we are now equipped not just for life but also for godliness. Where do you find glory and holiness today? Look low.